The ’90s are alive! Can anyone “guess who’s back, back again?” For shoppers who guessed Levi’s jeans, they’re correct. Our favorite blast-from-the-past, the forever iconic denim brand is once again a staple in our closets! Shop With Us: Nordstrom Reviewers Love These Soft, Stretch Skinny Jeans and They’re Under $100! Shoppers looking for the latest and greatest pair of denim? Let us recommend the Levi’s Women 710 Super Skinny. This pair is so amazing, they’ll have shoppers challenging the notion that only LA ladies can be blue jean, babies. 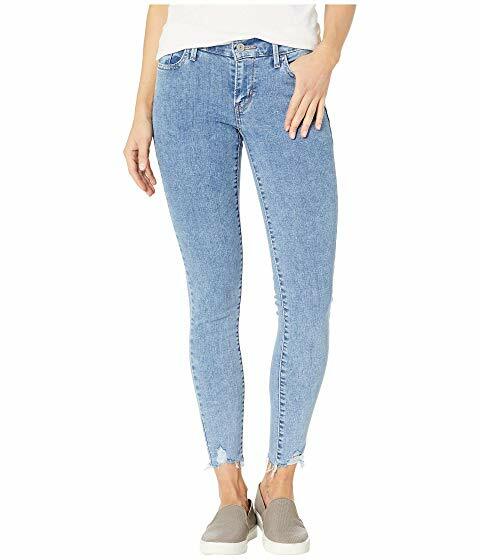 See it: Grab Levi’s Womens 710 Super Skinny starting at $41 at Zappos.com! The Levi’s Women’s 710 Super Skinny is perfect — and we mean perfect. The super skinny jean features a sleek, mid-rise and skinny fit starting at the hip and extending throughout the leg. Much like Levi’s 535 version, the 710 super skinny has advanced stretch and maximum flexibility, which means shoppers won’t just want to wear these jeans, they’ll want to live in them as well. The super sleek design includes the traditional leather brand patch at the back waist. There’s also a five-pocket design with a signature arcuate stitch and woven flag patch set at the back right pocket. We love that these jeans are equal parts classic and chic. The style options were endless when we heard that the 710 super skinny jeans included a belt-loop waistband. Think of all the belts! But our outfit inspiration got even more intense when we heard of the never-ending, and we mean never-ending, washes available. The available shades, in its entirety are the following: Roller Girl, Buena Vista Blue, In The Game, Frolic Blue, Lavender Honey Sateen, Light Pink Sateen, New Retro, Dusk Rinse, Indigo Flash, Palm Breeze, Refined Thyme, Refined Sodalite Blue, Secluded Echo, Outer Limits, Evolution, Indigo Splash, Just Sayin’, No Diggity, Spring’s Return, Street-Wise, Iced Aqua Sateen, Light Lilac Sateen, Odyssey Grey Sateen, Pine Grove Sateen, Potent Purple Sateen, Super Soft Harvest Gold, Super Soft Kalamata, and lastly, Super Soft Navy Blazer. Don’t worry, though, we can shout out our favorites! For those looking to keep things a bit more traditional, In the Game, (pictured above) is a light-wash denim that includes a shredded hemline. If clean, classic styles are preferred, we’d suggest options such as Just Sayin (a darker wash), No Diggity (a medium-wash, with rips throughout), Frolic Blue (a faded, medium-wash), Buena Vista Blue (an eye-catching, bright blue wash) or even, Indigo Flash (a muted light-wash with rips in the knee). These are the most versatile amongst the group as they can easily transition from day-to-night, whether we’re looking to dress an outfit up or down. Looking to achieve that effortlessly chic look? Pair any of those washes with a pointed-toe heel, white tee and oversized leather jacket. Too cold? Swap the white T-shirt and leather jacket for a chunky, knitted-cable sweater. Add a tailored, pea-coat for added warmth! Shoppers looking for a more eye-catching wash that demands attention? The 710 Super Skinny slays again. All that glitter is gold, in the super soft harvest gold wash. It can perfectly be paired with white chunky sweaters or long black cardigans. Looking for a more neutral look? Ideal for a full, head-to-toe, monochromatic look? We suggest throwing on a tan sweater to instantly elevate the look. Accessorize with gold jewelry and a matching bag! Talk about a golden globe ensemble, IRL. Not feeling the gold? Fear, not. The 710 Super Skinny has many bold colors up for grabs. Some of our personal favorites? The super soft kalamata which is named after green olives. Feeling a bit rosy? Select the light pink sateen which is one of the more delicate options and perfect for a soft-but-captivating look. The most striking of the bunch? The potent purple sateen which is a beautiful burgundy-eggplant hue. If hard to image, think of merlot. It’s more of a diluted shade of merlot. It is simply striking! Still searching for the right shade? The 710 Super Skinny comes in the basics washes as well. Our additional personal favorite includes, but are not limited to, roller girl which is an excellent off-white option. There’s also the fan-favorite shade of black, available in secluded echo. Reviewers can’t help but rave about these jeans since, with all the available shades, there is a pair to last for months! If that wasn’t enough, unlike traditional denim, these will not bunch up at the ankles. Reviewers love the more fitted style. Best of all? The jeans feel as if they were perfectly tailored for our own body. The stretchy waist practically molds to our hips. How fabulous is too fabulous? Reviewers can’t help but go on and on over the magic of the 710 Super Skinny and we can’t help but agree. For the 710 super skinny, it’s not exactly a comeback, if they never left. 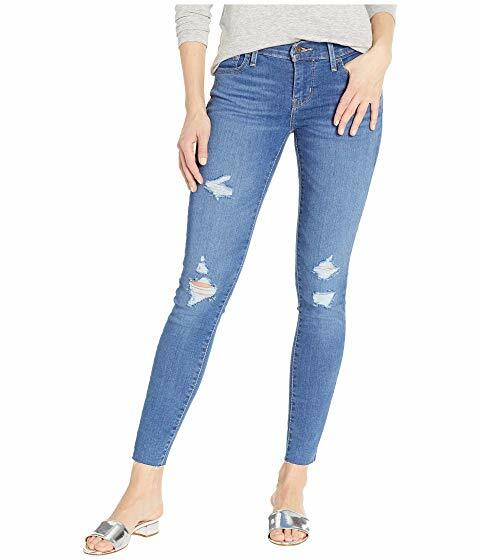 See it: Grab Levi’s Womens 710 Super Skinny starting at $41 at Zappos.com! Not your style? Check out additional denim washes at Zappos.com!